AUP Global | President Celeste Schenck - The View From AUP - January 2018! 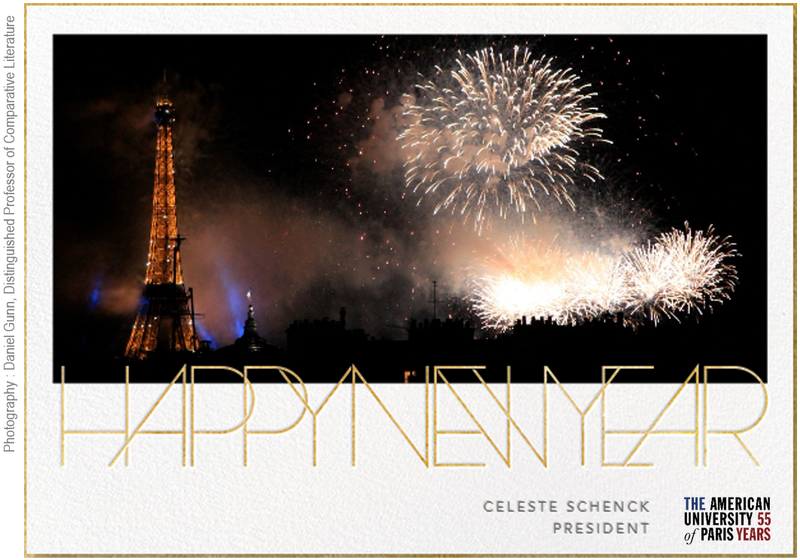 President Celeste Schenck - The View From AUP - January 2018! In this new year full of promise and new beginnings, I wish each and every member of the AUP community a year of fulfillment of your dreams, and to our planet and the world’s peoples a more peaceful and prosperous one than the one we have recently lived. Walking in Paris this past weekend in the crisp January cold, I was struck yet again, and always anew, by the beauty of this city and the diverse group of people who inhabit it. Surely people can find a way to live together peacefully and respectfully, building on their commonalities and learning how to negotiate their differences. May this new year bring breakthroughs on that front in every household and on a global level. That is the work we do every day at our profoundly international university at the confluence of Paris, Europe and the world, sending our students out into the world as our emissaries, where they will make powerful change in the communities, civil societies, and countries where they find themselves. Embedded in this newsletter just below are my hopeful new year’s voeux to all of you, illustrated by Distinguished Professor Dan Gunn’s beautiful photo of the Eiffel Tower lit up by fireworks. This past fall I got behind in my newsletter writing (which I will remedy this spring with an extra missive) largely because I was traveling the globe near constantly to meet alumni and parents so far flung that they inhabit 145 different countries. My travel took me to New York where I joined 20 alumni who form the President’s Alumni Advisory Council (PAAC) there, part of a global network soon to be a hundred strong comprising five PAACs located on the East and West Coasts, in Europe and the Middle East, and perhaps soon in Asia. Those dedicated alumni form a protective and supportive circle around AUP, advising leadership on everything from career trends, communication strategies, and curricular revision to questions of mission, strategic growth and vision. Most important, they—along with their peers everywhere in the world—send us internship and job offers for current students, which we in turn post on our career website. One of our alumni in London has already hired 12 interns from AUP, because he is so convinced that only the global explorers we graduate have the mindset to thrive in his company. Countless other alums serve as career mentors, advising students on campus by video conferencing or FaceTime. Last year alone, over 1000 hours of volunteer time flowed from our alumni and parent community back to students on campus. My thanks in this new year to all of you who contributed to this virtuous circle. My travels also took me to South Africa to visit an NGO called Afrika Tikkun created by the grandfather of a recent alumna, Takara Lubner. We had honored Bertie Lubner, her grandfather, several years ago at graduation with an honorary degree. But I had yet to see the work this organization accomplishes—from cradle to career—in early childhood education and accompaniment of school children through high school in the townships of Johannesburg and Cape Town. Today those programs are run by people who “graduated” from its curriculum. At the airport a policeman saw my Afrika Tikkun bag and came up to me to say that he owed his life’s work to the program’s support. Suffice it to say that I returned to campus an even more fervent believer in all that can be accomplished when people of good will join together in efficient and thoughtful action. We are hoping to create a South Africa practicum with our “family” there, which will bring over students from campus for a month each year, in much the way that our Global Communications Department has done for ten years in Auroville, India. More on that extraordinary program in my next newsletter. 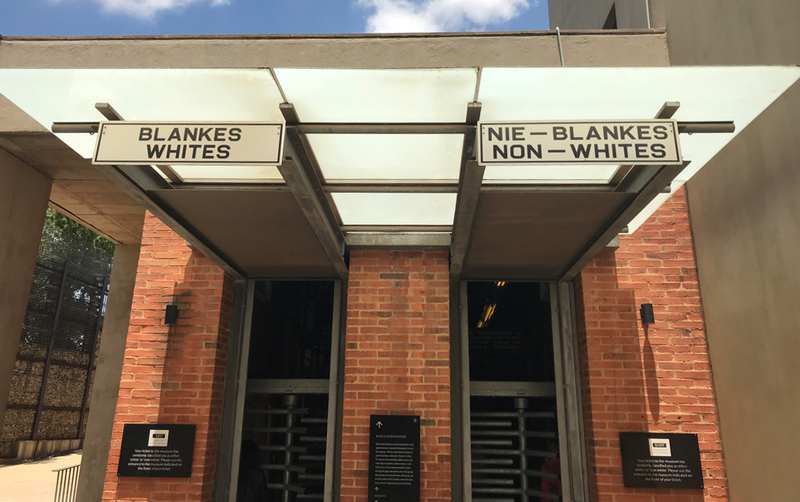 While I was in South Africa, I also visited Nelson Mandela’s and Archbishop Desmond Tutu’s homes in Soweto and the Apartheid Museum. Offering an astonishing and horrifying yet uplifting immersion experience, the Museum made me think of the Polin Museum in Warsaw I visited last semester with students and faculty. You are randomly assigned a black or white ticket upon entering the museum, which permits you to witness through a glass partition the very different passageway through for holders of the other color card. The technologies and ideologies of dividing people against one another are startlingly similar in fascist states, an object lesson for our times. Finally, I wanted to share with you some of the work being done on campus—by our own students and faculty—around the theme of #metoo, perhaps the most rousing international battle cry of last year. In December, Madison Haddix, a visiting independent student in Comparative Literature, wrote an opinion piece for The Washington Post in which she recounted her experience last year as a teenage Senate page and stated unequivocally her reasons for opposing the re-election of Roy Moore of Alabama. She describes her non-partisan experience in the Senate: “I am a Democrat, [but] my appointing Senator, Lamar Alexander, is a Republican. I plan to vote for him when I reach legal voting age based on the incredible leadership and ethical code I witnessed while serving.” Madison insists that “pages witness history, but in our own little way, we affect it, too.” She likes to think that Senators think of the pages as they are enacting legislation, imagining the impact it will have on future generations inheriting the laws they write. As she saw it, “Moore’s potential election to Senate is not just a betrayal of those women, but a betrayal of something much more fundamental: the trust that young people have in our leaders.” Proud of Madison for speaking up about a subject she holds dear, I invite you to read her whole piece here. The hashtag #metoo has had its day not only in the United States, but also in France where it purportedly had its origins in #balancetonporc (translated as “squeal on your pig”), and at AUP where students and faculty are reflecting together on the meaning and importance of speaking out against sexual violence of all kinds. Recently French actress Catherine Deneuve censured the #metoo movement, bemoaning Anglo-American puritanism and the loss of la seduction between men and women, only to have her words deeply instrumentalized, as she saw it, by other French women activists and speakers, which in turn led her to denounce those who had purportedly joined her cause wrongly, and to apologize to victims of sexual assault who felt assaulted by her position. Associate Professor Lissa Lincoln, who heads AUP’s growing Gender Studies Program and Major at AUP, presides over a range of thought-provoking courses at AUP that our students are taking to make sense of such timely issues: “Women, Empowerment and Development,” “Law, Gender and Identities,” for example, and she’s even teaching a course on “Masculinities” this spring. Professor Lincoln is co-organizing two conferences in the coming months on the topic, the first a colloquium on #balancetonporc (with the École des Hautes Études en Sciences Sociales and the French national research laboratory CNRS) and a second on “Orders of Violence” (in partnership with AUP’s The George and Irina Schaeffer Center for the Study of Genocide, Human Rights and Conflict Prevention) dedicated to investigating political violence, exclusion and memory within marginalized communities, with particular emphasis on caste and genocidal violence. Inspiring to her students, Professor Lincoln is making global connections amongst American, French and vastly international crusades for the dignity, safety and respect for women. Meanwhile students on campus are studying, traveling, and learning across cultures more than ever before. In my next newsletter I’ll share videos of recent trips to Cairo and India, as well as a sneak preview of the Centennial Conference on the Versailles 1919 Peace Treaty to be organized by our Center for Critical Democracy Studies. This conference will be part of a pair on the global order created by the Treaty, which will be co-organized by AUP and The Belfer Center for Science and International Affairs at Harvard University’s John F. Kennedy School of Government. Nicholas Burns, former career-diplomat, US Ambassador, current public policy specialist and academic, who received an AUP honorary degree in 2017, is the Center's director and our partner. Last but far from least, AUP has a new Provost. We will be welcoming to campus on August 1 William Fisher, an anthropologist and specialist in Nepalese culture and language, and more generally in international development, formerly Dean of the Graduate School and Associate Provost at Clark University, former faculty member at Harvard, Columbia, Barnard College and NYU. As always, I enjoy hearing from members of the AUP community in response to any of the ideas I share in my newsletters. Feel free to write to me at president@aup.edu or to consult the full archive here. The AUP e-newsletter is now available for January/February!